(Boston, MA) – BOND, the Northeast’s premier building, civil, utility and energy construction firm announces the expansion of its New Haven, Connecticut office. 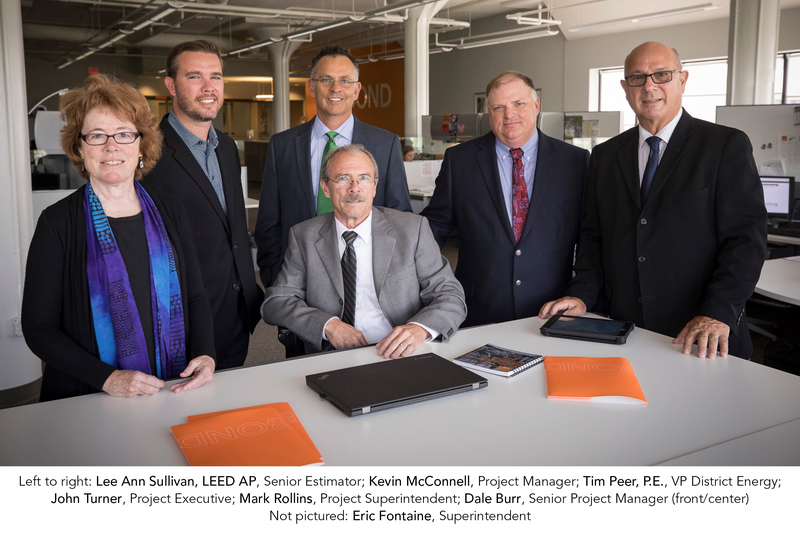 BOND adds a team of professionals to service traditional Building Division clients in the education, healthcare and district energy markets. This announcement comes on the heels of several new project wins for clients such as the University of Connecticut (UCONN) and Yale University. Tim Peer, P.E., Vice President, District Energy continues to lead a specialized team of professionals focused on delivering complex district energy projects for clients in the higher-education market. Tim has over 25 years’ experience solving the unique challenges and requirements of campus district heating, cooling and microgrid projects. He was recently appointed to the Board of Directors of the International District Energy Association (IDEA). John Turner, Project Executive joins Tim Peer, PE as senior leadership on the District Energy Team as part of the Building Division. He brings more than 24 years of utilities construction and project management experience in cogeneration and central utility projects that have spanned across the higher education, manufacturing and pharmaceutical industries. John’s diverse background in the industries of design, operations, maintenance and commissioning have given him a broad understanding of client needs. Mark Rollins, Project Superintendent is a proven construction supervisor with onsite management and field supervision experience. He has supervised multiple projects in the fields of healthcare and energy and works effectively with architects, engineers, contractors and inspectors. In his role at BOND, he creates accurate takeoffs and manages contracting, purchasing and invoicing with a high level of skill. He is also well experienced in reading process and instrument drawing (P&ID) and isometric piping drawings. Lee Ann Sullivan, LEED AP, Senior Estimator brings her experience and expertise in estimating and preconstruction services within the context of a wide range of delivery methods including construction management at risk, lump sum bid and design build. Lee Ann has led major projects in healthcare, pharmaceutical, education, infrastructure and commercial markets. She is a LEED Accredited Professional and holds a Bachelor of Arts degree in Engineering Studies from Lafayette College. Kevin McConnell, Project Manager brings strong expertise managing construction projects from preconstruction to turnover. With 13 years’ experience, Kevin works cohesively with all members of the project team to oversee project operations including scheduling, procurement, tracking and billing. His project portfolio includes higher-education and K-12 renovations, laboratories, corporate interiors and transportation facilities. Dale Burr, Senior Project Manager joined BOND in 2015 and brings strong value to the Connecticut team with over 30 years’ construction management experience. He recently managed the successful completion of UMass Dartmouth’s new School of Marine Science & Technology (SMAST), a $55 million, world-renown facility. Dale centers his projects around forging client partnerships through consistent communication and strong team management, leading to superior construction results. For more information on BOND’s New Haven Building Division services, please contact Bo Koloski, Director of Client Services at jkoloski@bondbrothers.com or 401.429.0808.